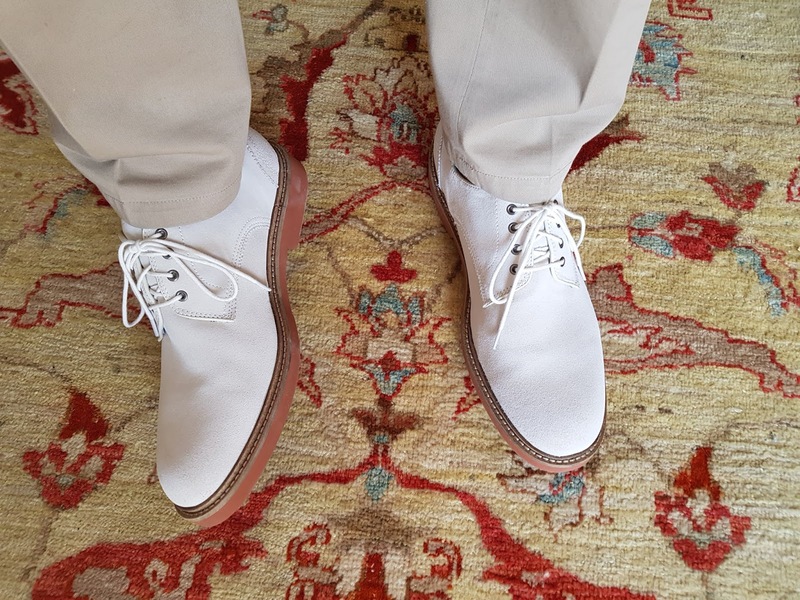 There are few shoes that represent summer more quintessentially that white bucks (short for Nubuck). 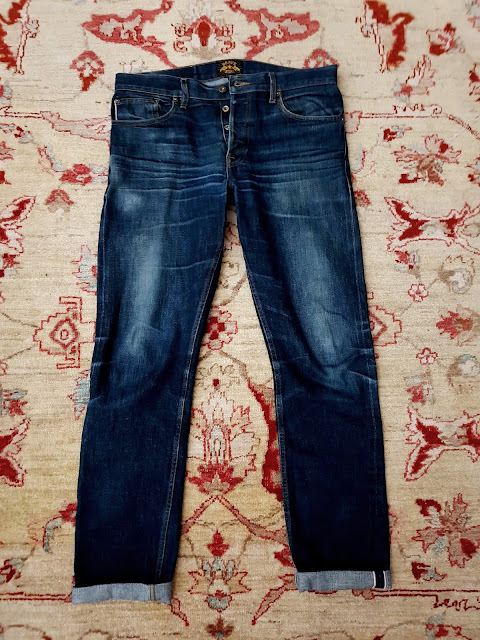 look at photos of American College-age men dressed for summertime from the 1950s and chances are, they'll be sporting white bucks in various levels of distress. So prevalent were these shoes among the attendees of Ivy league colleges that East coast law, investment banking, and management consulting firms which drew their new recruits from these elite universities became know as 'White Shoe' firms. 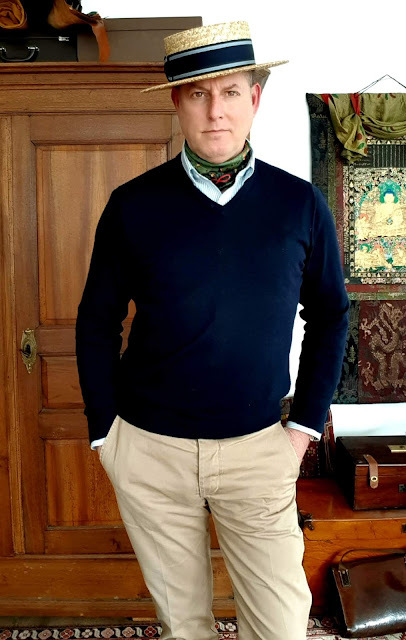 New York Times Magazine published an interesting article by William Safire on the topic way back in 1997, which is worth a read. 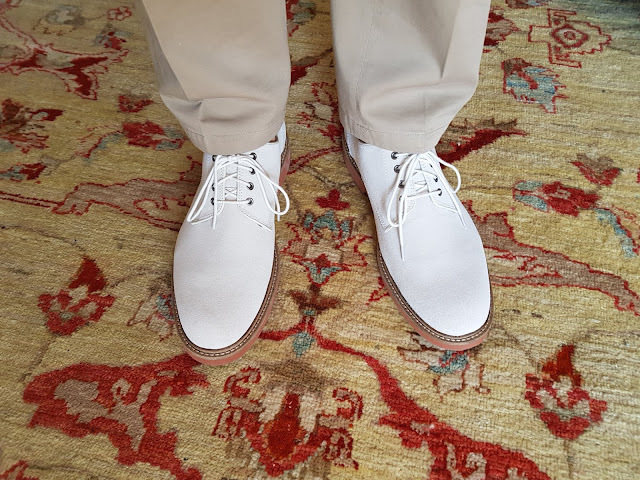 In any case, if you're a man who loves traditional dress, a snappy pair of white bucks are a must have for the summer months. 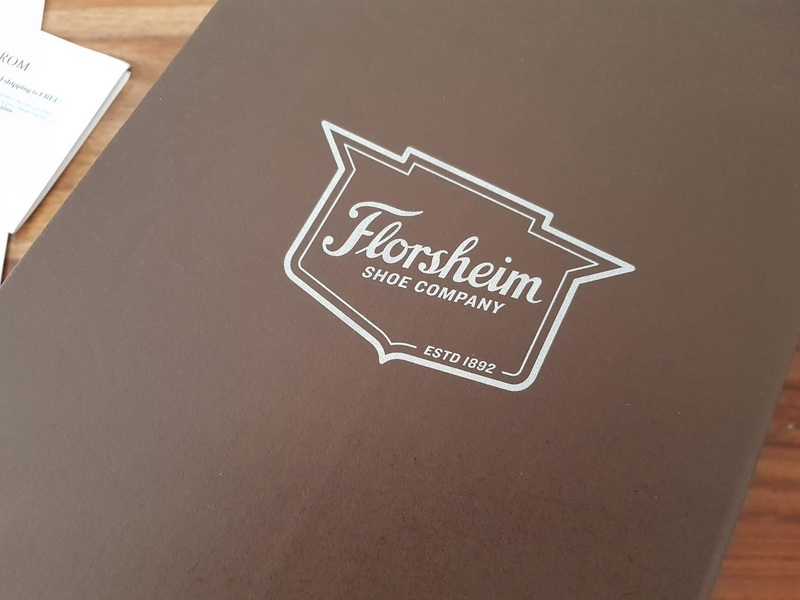 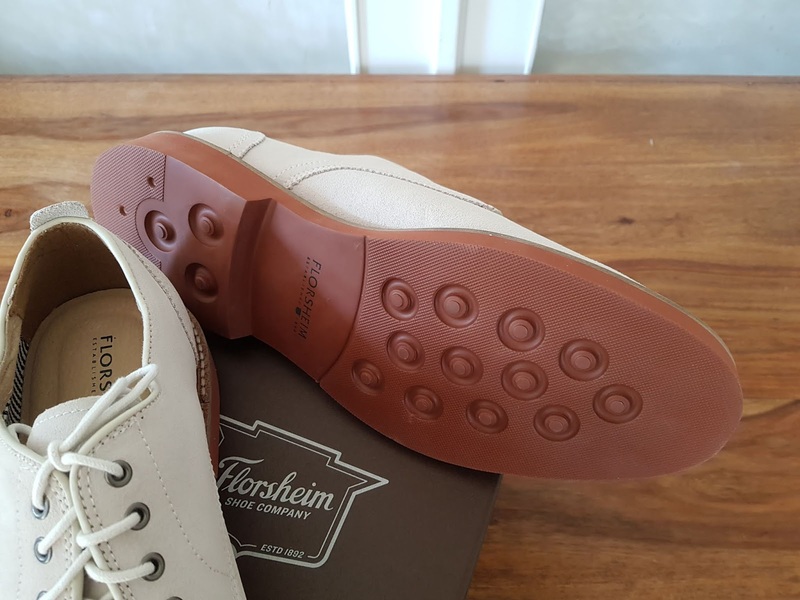 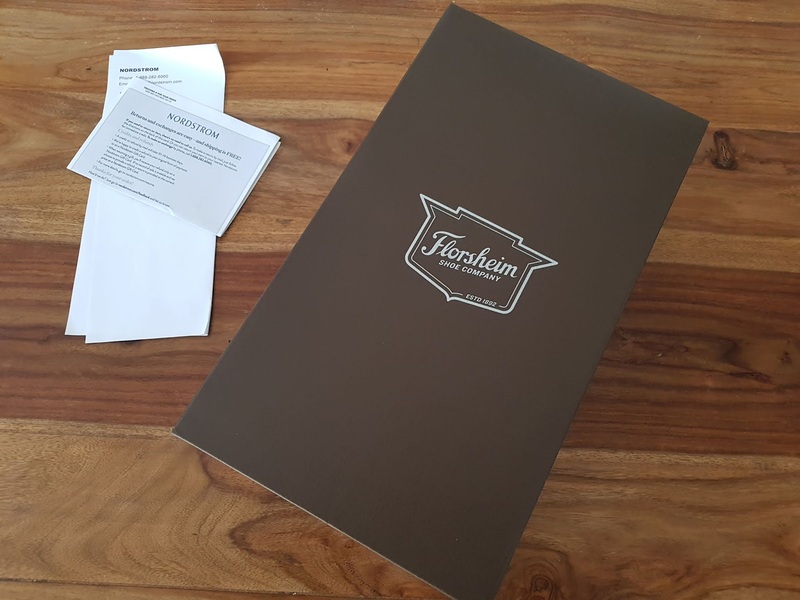 I am happy to say that I've recently taken delivery of a great looking pair of Bucktown' White bucks by Florsheim via the Nordstrom website. 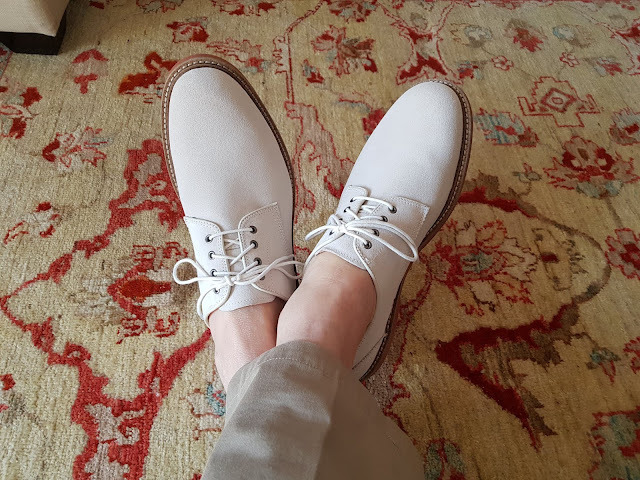 These beauties are nicely made from white suede with a very lightweight brick red rubber sole, a cool striped cotton liner, and with a padding pigskin leather footbed. 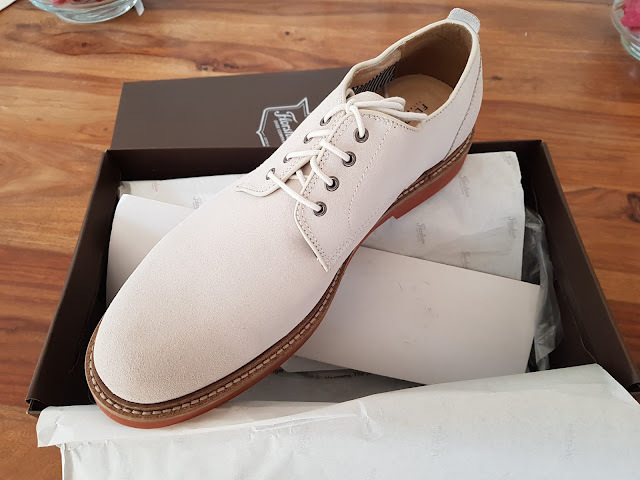 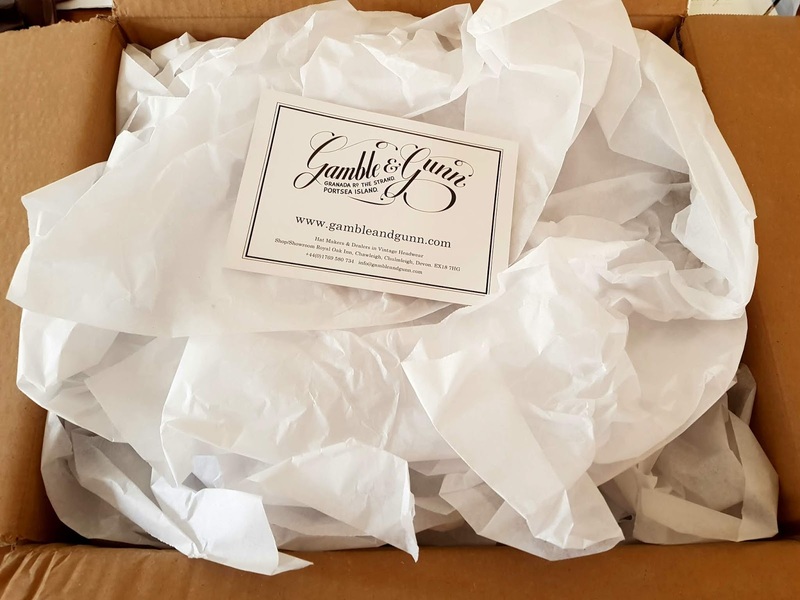 The sole is more spongy that for instance Dainite sole (even though of similar design) and the shoes are therefore lighter and provide a much softer step. What this sole gives up in durability, will doubtless be made up for in comfort. These shoes very certainly are soft and flexible with the comfort and weight of court shoes. 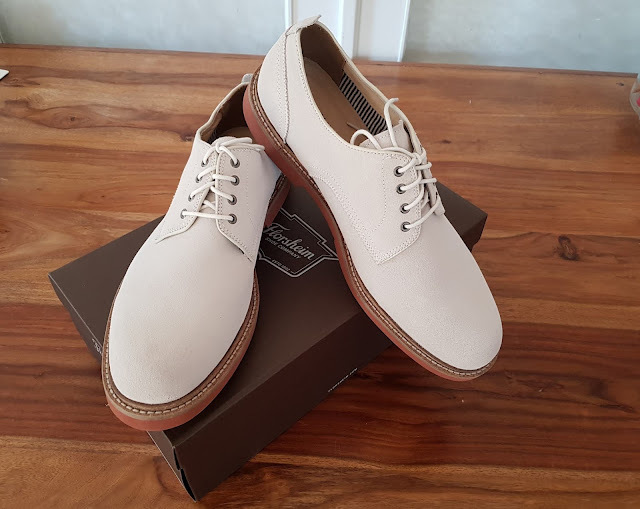 These shoes are best suited for casual office wear, garden parties, around town, and resort wear, not tromping through the countryside as grass stains will be difficult to remove. 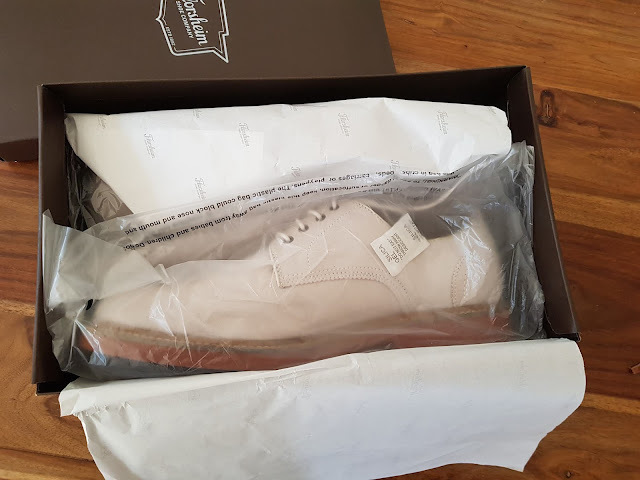 I am looking forward to enjoying many days at the lakeside drinking G&Ts while wearing my 'Bucktown' white bucks. 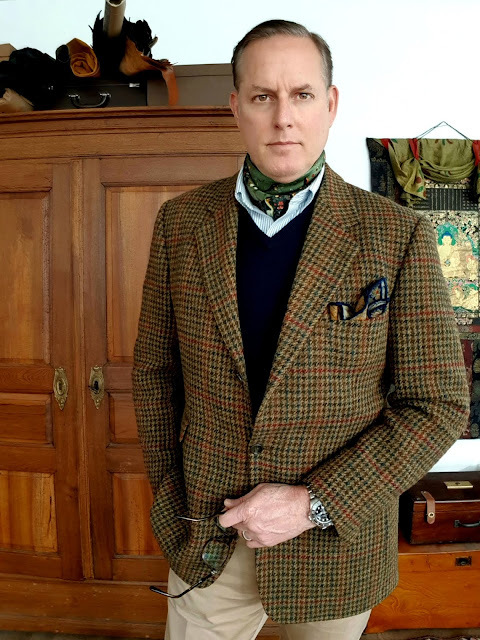 I can even envision seersucker in my future. I'm getting thirsty already. 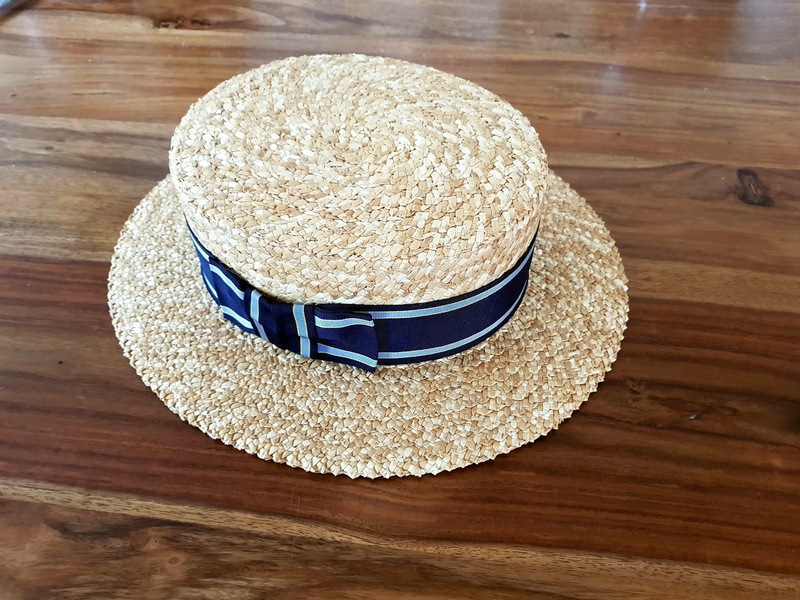 Those of you who have been following The Landless Gentry blog for a while will know of my fondness for the classic Boater Hat. 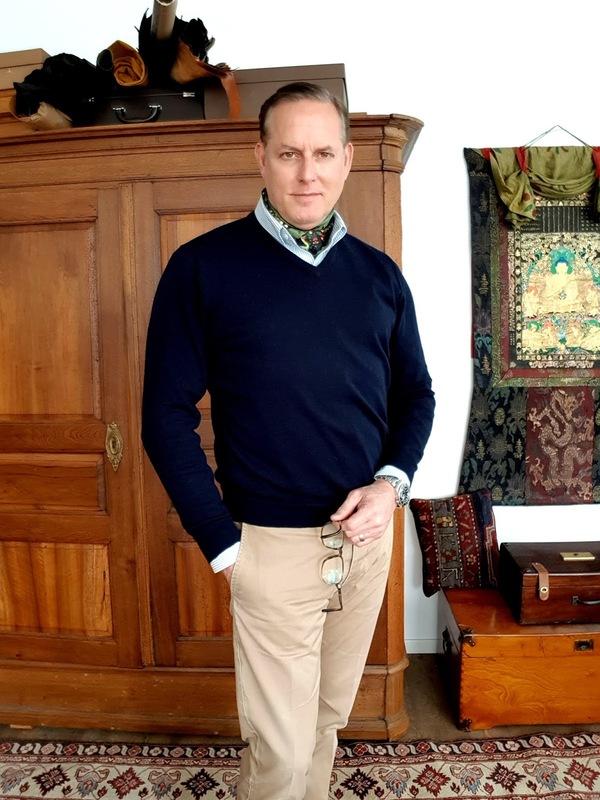 It's accessory for Spring and Summer that adds a great deal of character and a huge dash of style to just about any traditional summertime outfit (this is true of both men and women). Last year having acquired a Panama boater hat with I still love, I've decided for this year to add a more traditional stiff straw boater. During my online searching, I kept coming back to this very special Boater hat from England's Gamble & Gunn hatters. 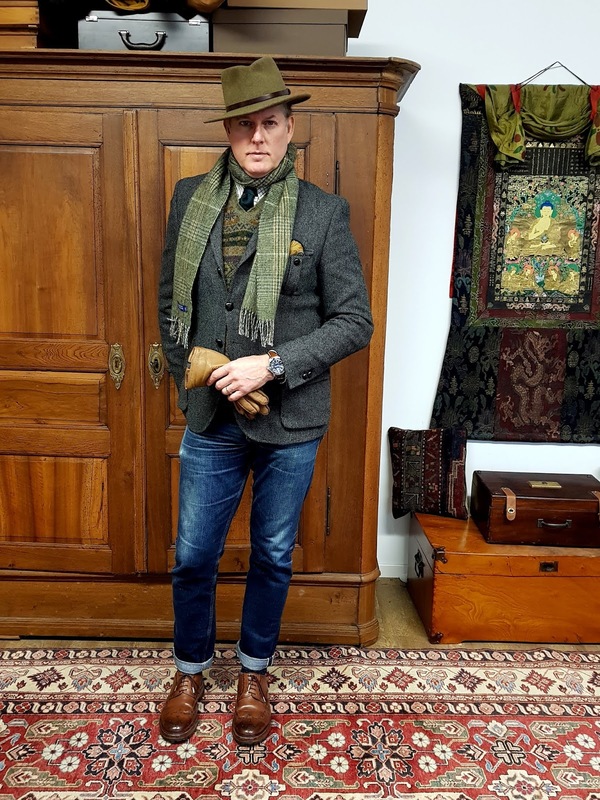 Located in Devon, UK, this traditional hatter have a really wonderful and informative website offering everything from tweed caps and traditional felt hat to a couple of models of straw boater. 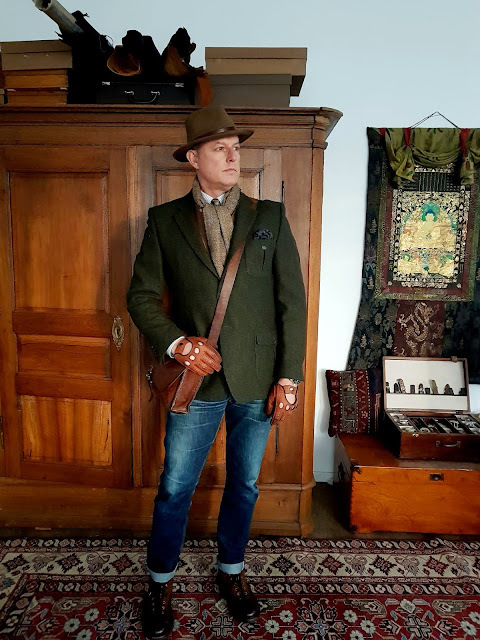 Needless to say, I was smitten. 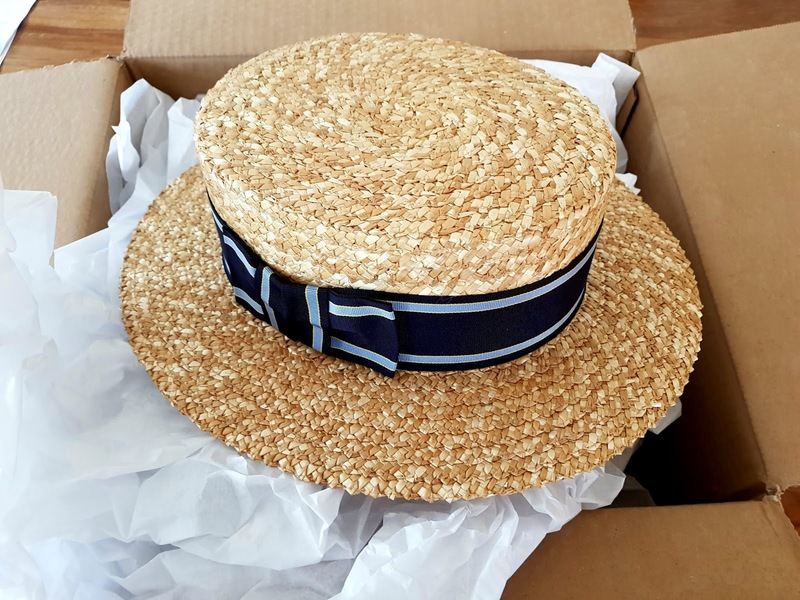 Having ordered, the hat arrived very quickly to me here in Germany from England packed nicely and I must say, I couldn't be more pleased. 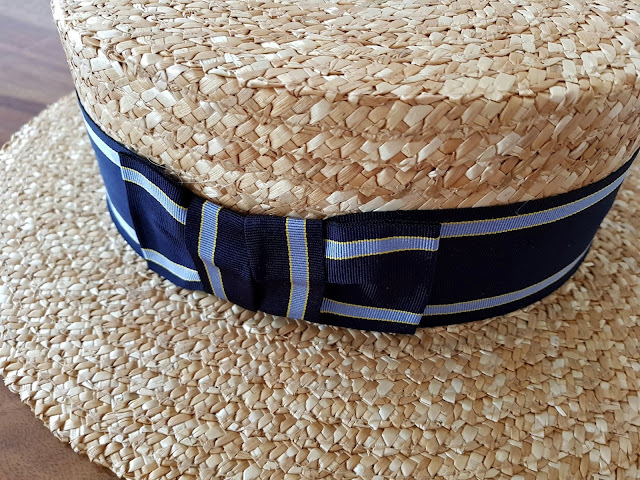 The hat itself having been made in England is of very high-quality construction and the ribbon is stunning. 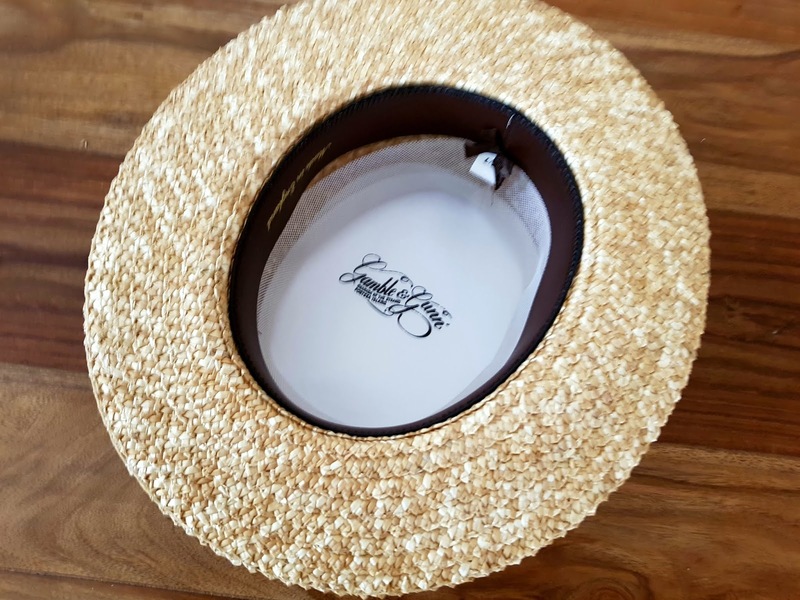 Inside a Gamble & Gunn's great looking label and a very nice wide genuine leather sweatband. I ordered a size larger that is recommended because I wanted to add some padding for my unique long oval head shape to add a bit more comfort (these hats are pretty stiff) and with the addition of a bit of foam inside the sweatband, the hat now fits me well. 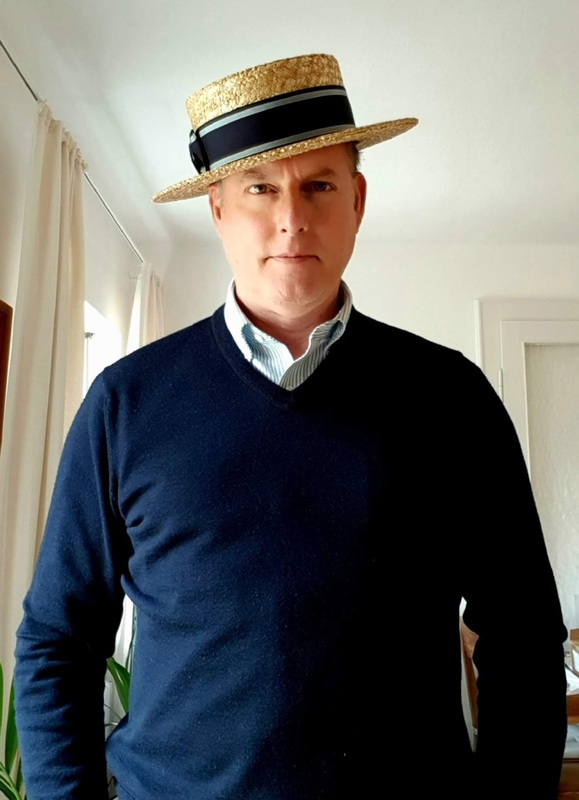 I'm looking forward to warming summer days wearing my great new hat, which I fully expect to wear with joy for many years to come. The "Kunst- und Wunderkammer" or Art and Curiosity Chamber of Trausnitz Castle remembers a tradition of the Dukes of Wittelsbach to collect exotic items and curiosities. 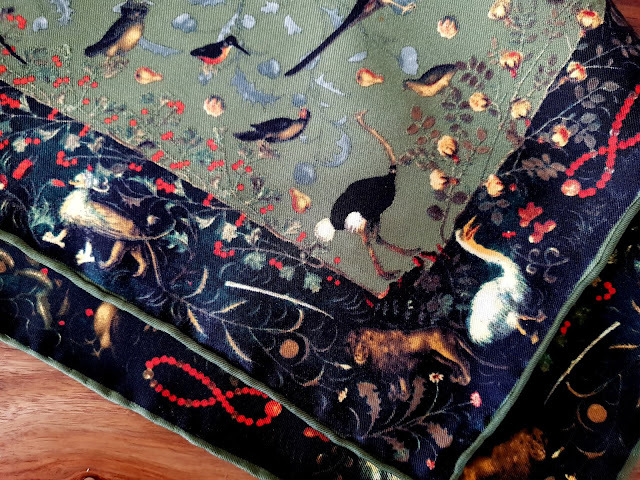 A very precious piece is a picture table of the 16th century which shows a garden of paradise with animals, flowering branches and fruits. 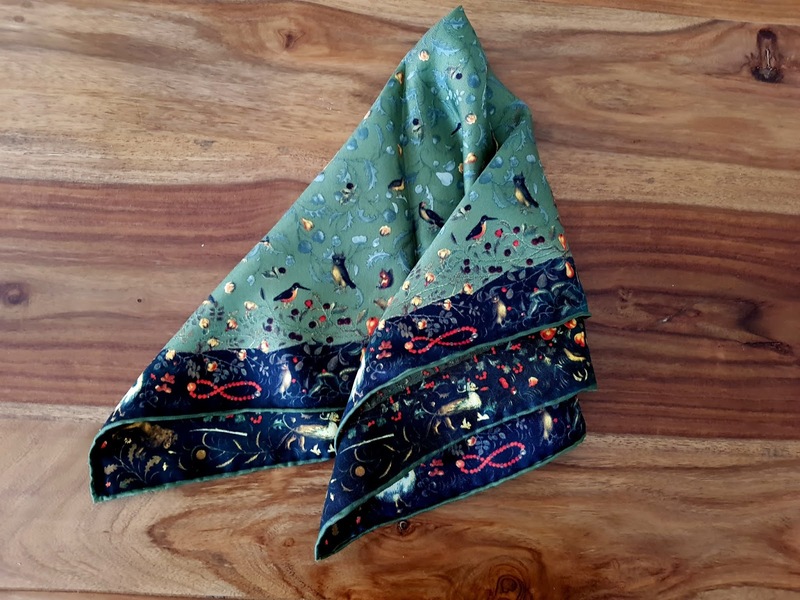 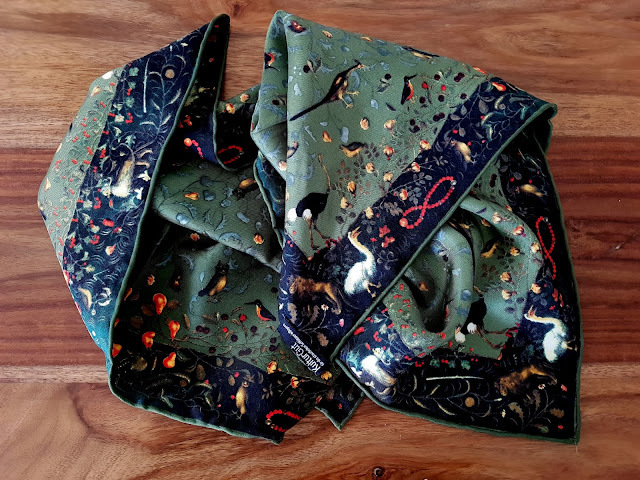 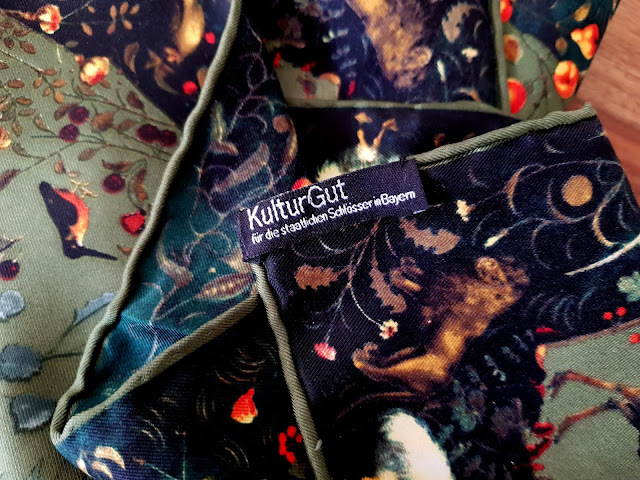 The 'KulturGut' or "Good Culture" collection offers a number of silk clothing/scarves and other beautifully made objects including ceramics, whose patterns are borrowed from or inspired by treasures in various state-owned Castles and Museums of Bavaria. Drawing from the rich cultural heritage and art of Bavaria. 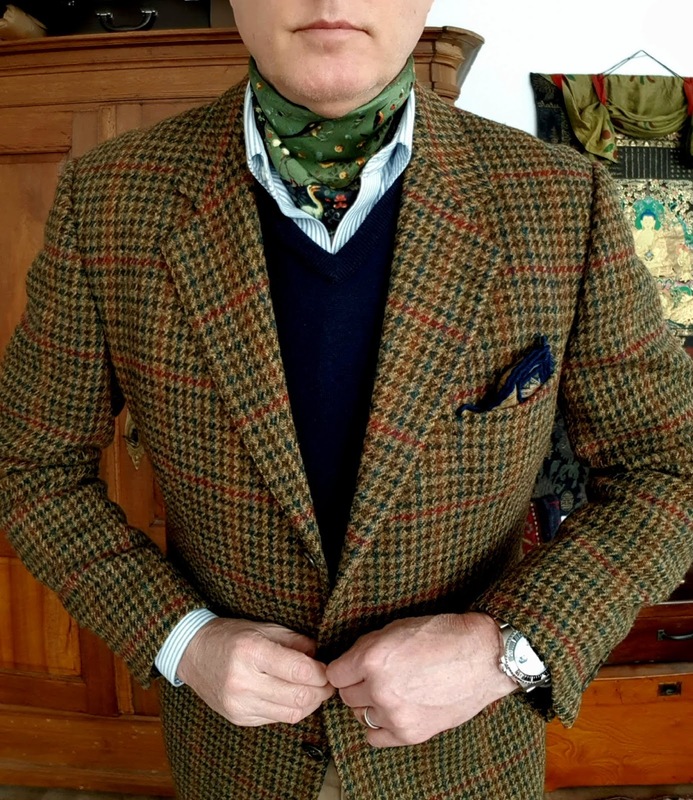 Some items in a traditional man's wardrobe are simply essential, must have staples. 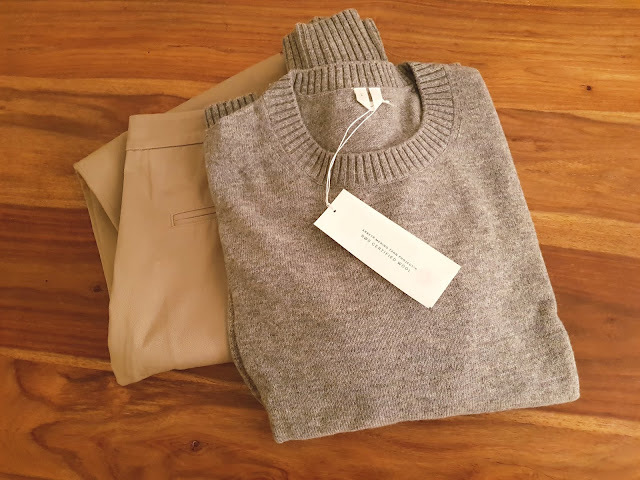 The Oxford strap Oxford Cloth Button Down (OCBD) shirt, a quality pair of chinos and an Oxford Grey crew-neck wool sweater are unquestionable such items. 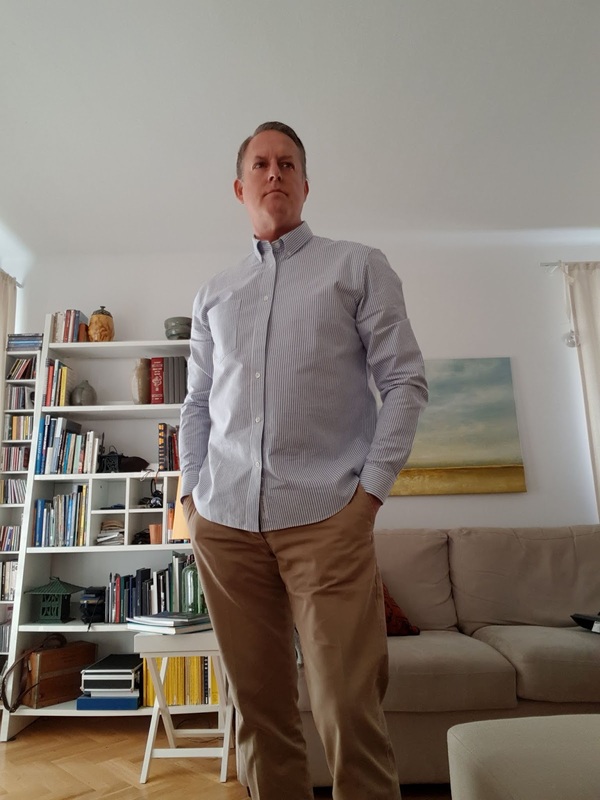 I'm convinced that given these wardrobe staples are in heavy rotation, they needn't be super expensive items with diligent shopping, one can find great quality clothing generally for prices that won't break the bank. 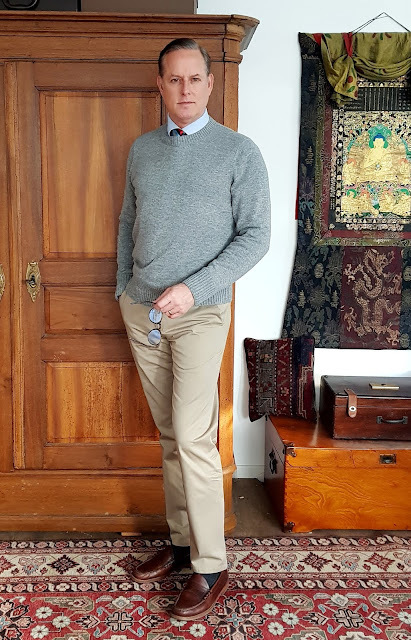 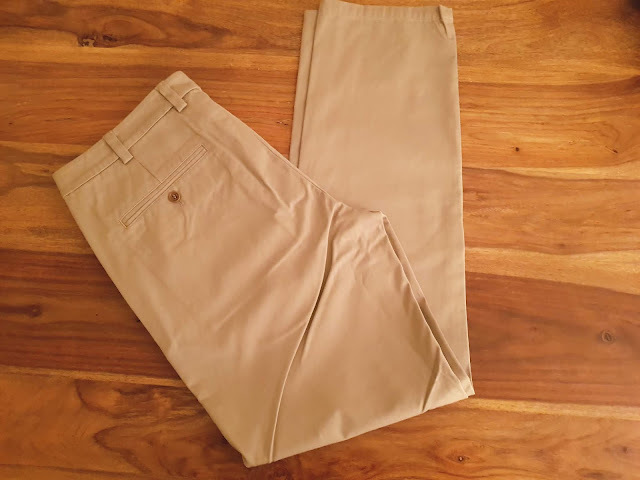 Having been referred to Arket via a post I saw on Instagram, touting their chino work trousers sent me to their website where I found these 3 pieces which appeared to be extremely well thought out and executed and at prices that even my rather frugal budget can afford. 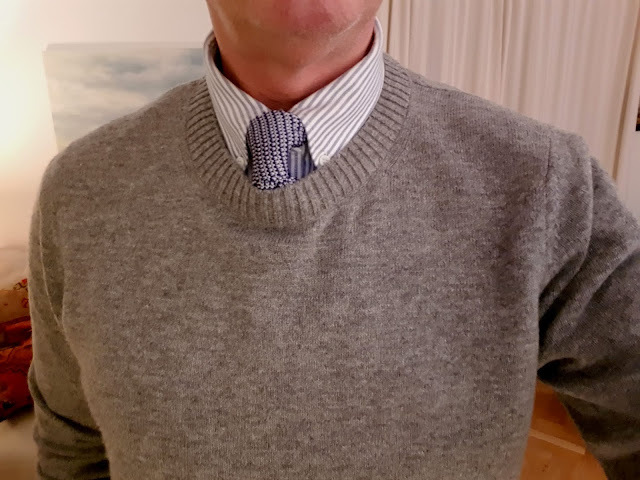 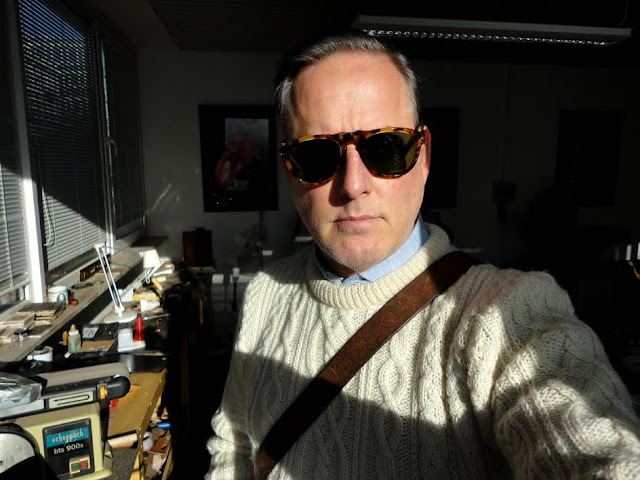 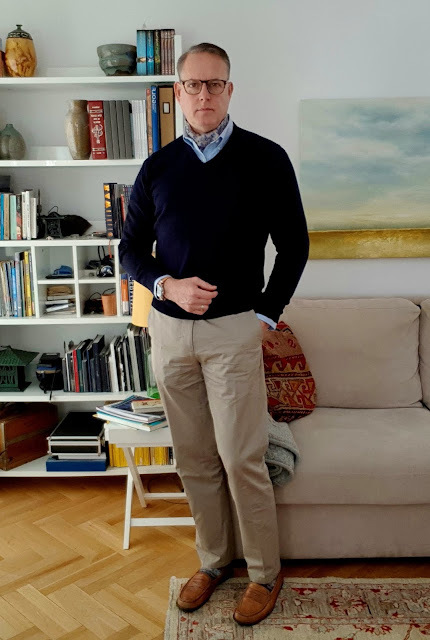 Arket is a Swedish company which specialized in high-quality clothes for man, women, and children as well as housewares at reasonable prices. 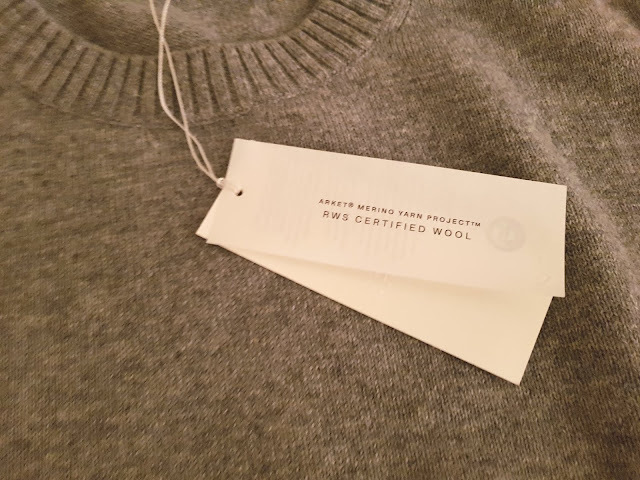 I had been shopping for a good quality OCBD shirt for a while to add to my rotation and the shirt from Arket seemed to fit the bill nicely. 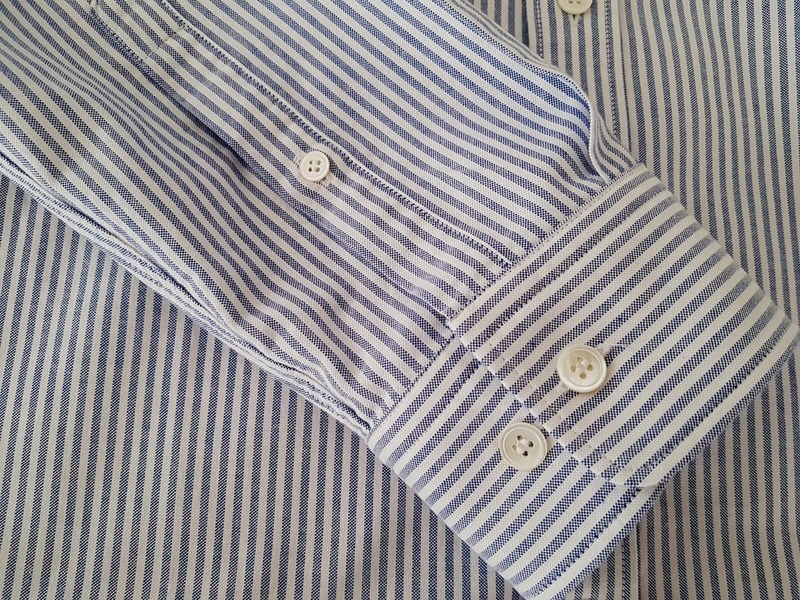 I know there are a hand full of old-line companies which are famous for these shirts such as Brooks Brothers, Mercer & Sons, J. 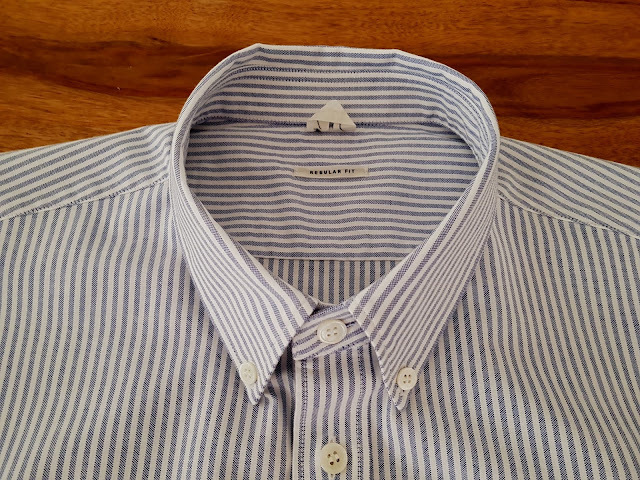 Press, and Japan's Kamakura, all of which, I'm sure making excellent quality shirts, but their pricing with import duties into Germany make these options price prohibitive for me. 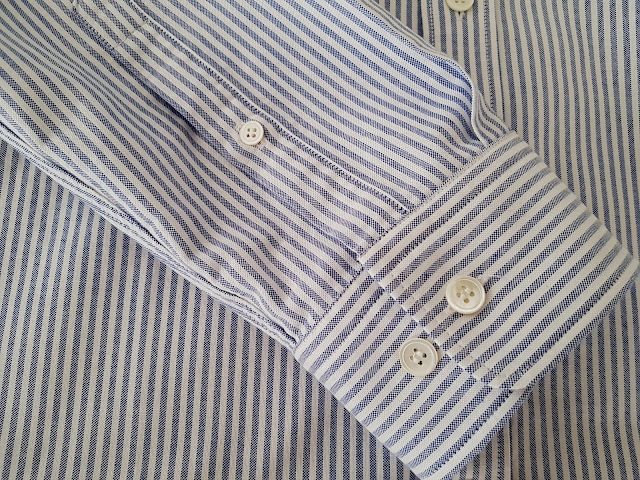 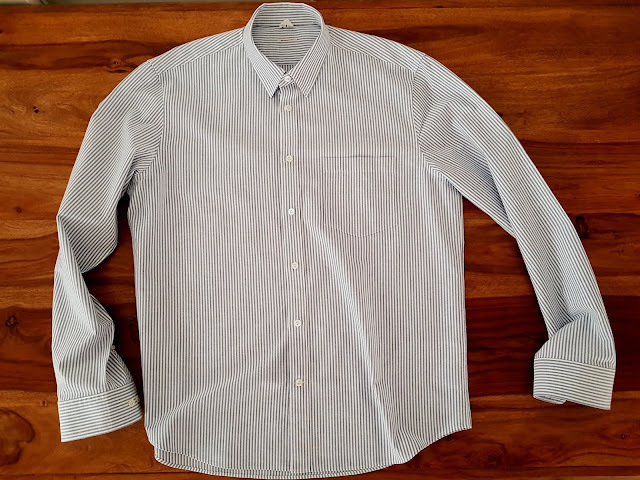 Arket's Shirt 3 Oxford has most of the details I was looking for including 100% organic cotton content and genuine Trocas shell buttons for a fraction of the price. 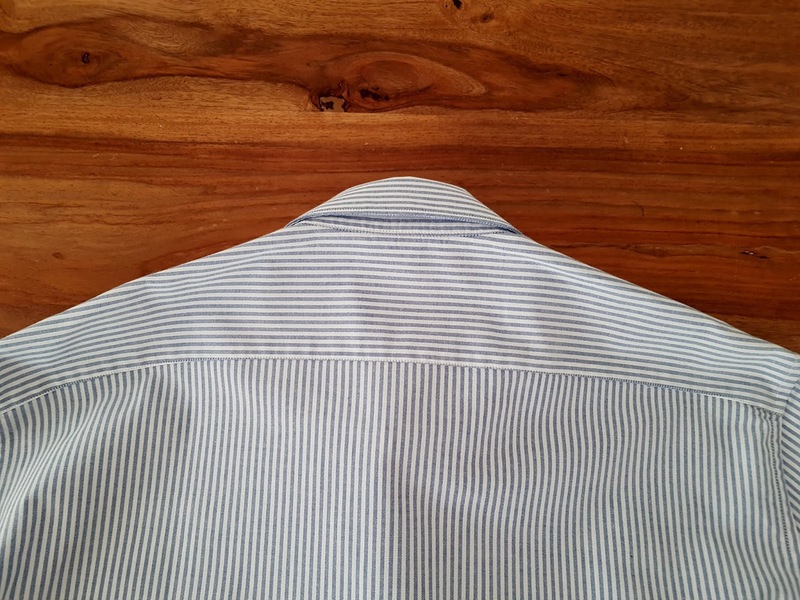 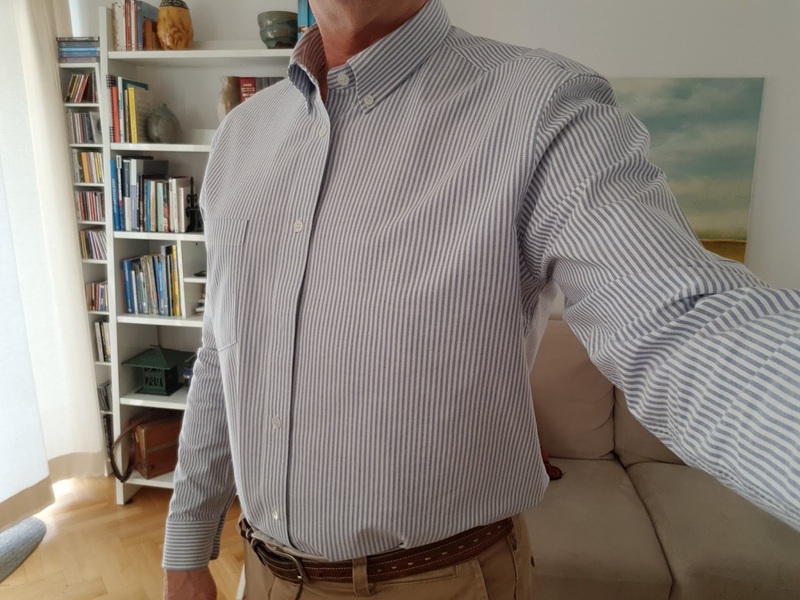 Made from a nice heavy weight Oxford cloth, this really feels like a quality item that will last years and break-in nicely and become softer with wear. 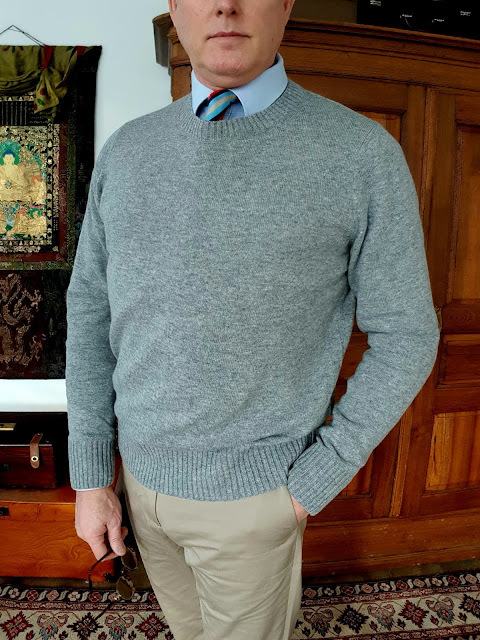 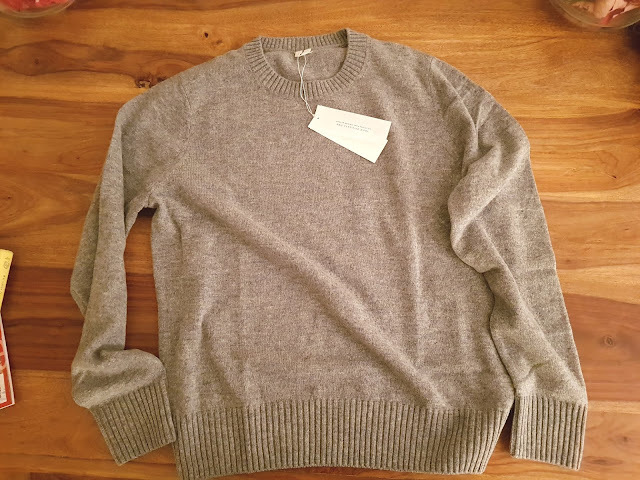 This Merino sweater again in nicely made with large ribbing at cuffs, neck, and waist, and knitted using a wonderful multi-hued melange grey yarn. 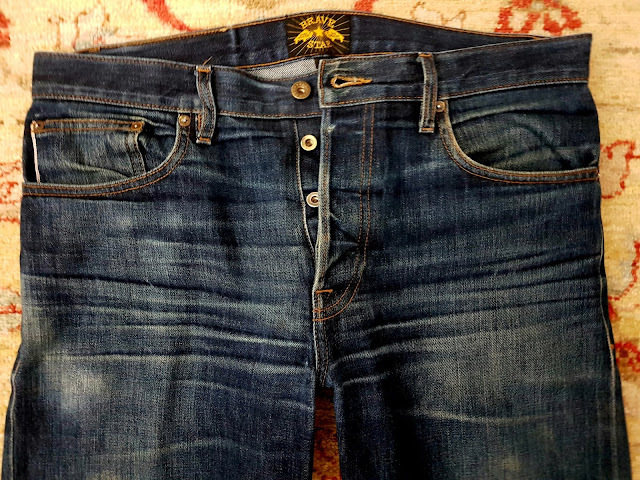 I purchased their size large, which fits well my 44-inch chest and 6-foot,2-inch frame. Knitted in a plain jersey knit, this jumper is made of RWS certified merino wool. 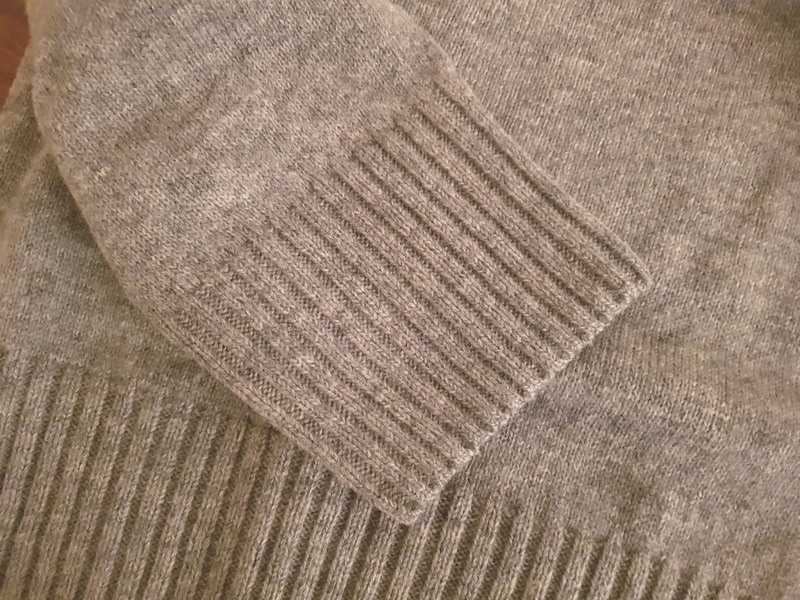 RWS stands for Responsible Wool Standard (RWS) which makes it possible to trace the material all the way back to the farm. 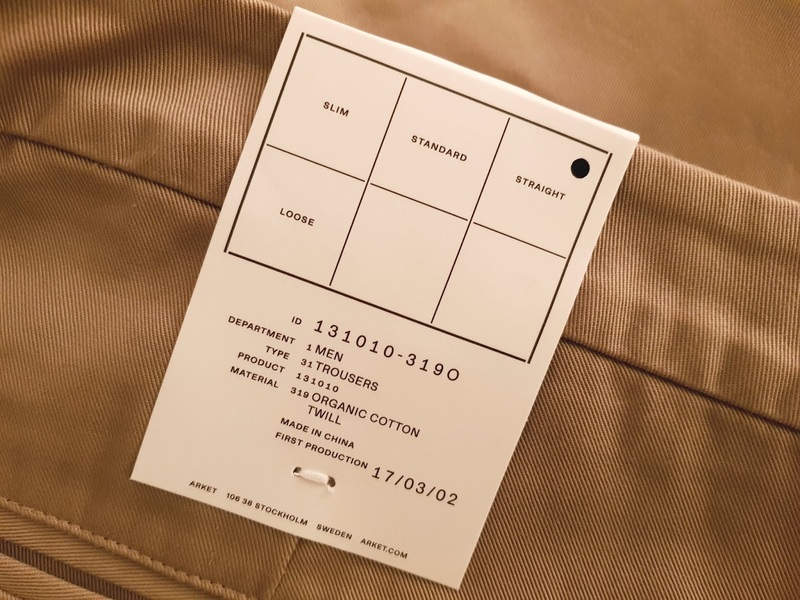 For full details, I recommend a visit to the Arket website. 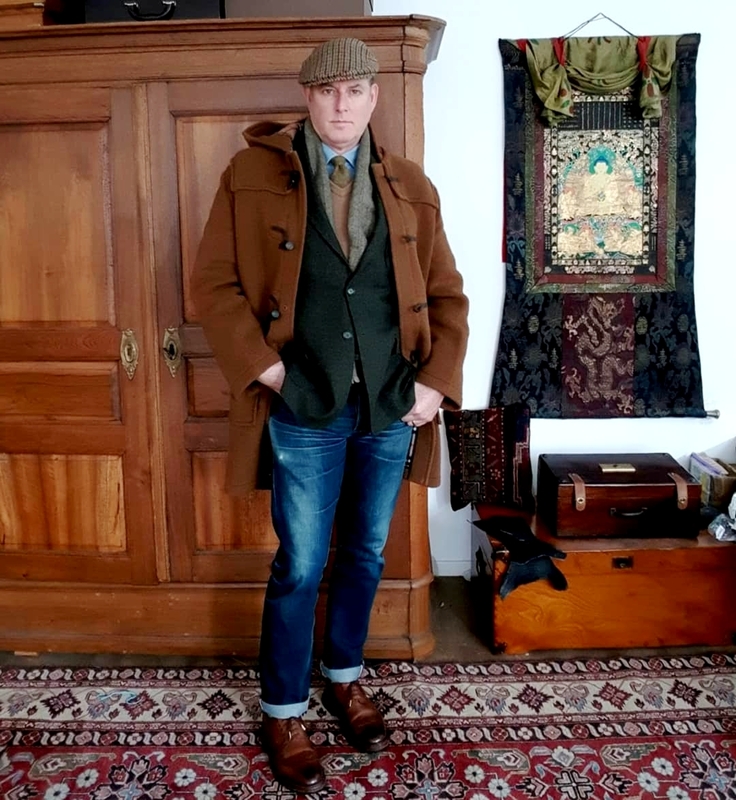 While I know that many traditional dress gentlemen are not lovers of denim, I dear readers are not one of them. 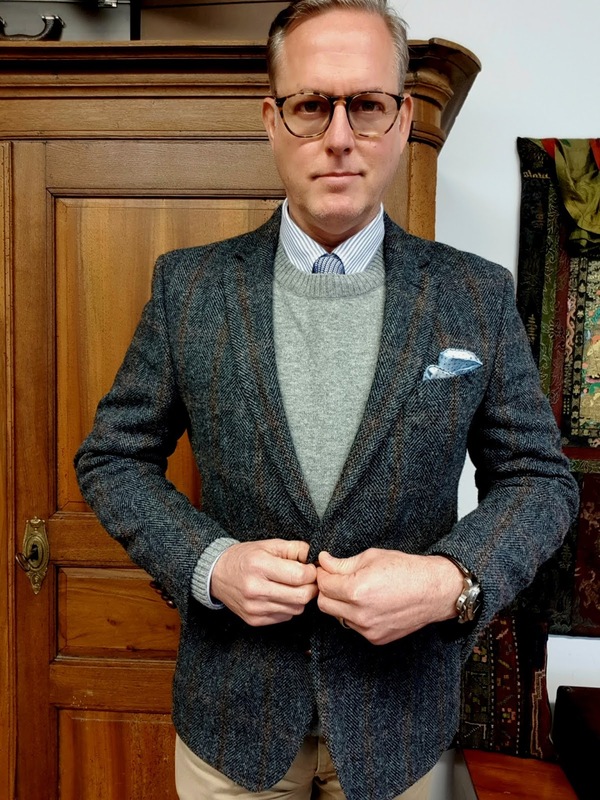 I think that a good pair of jeans can look great when combined with tweeds of all sort and they are a staple of my wardrobe. 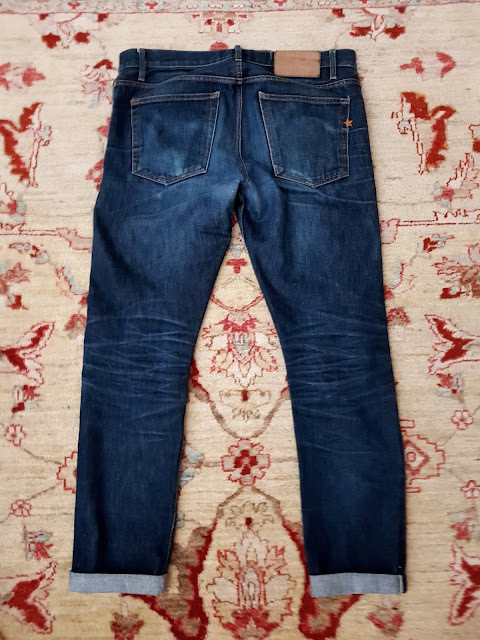 The ruggedly built selvage denim trousers from BraveStar Selvage made up from Cone Mills 15oz denim cloth in their 'Slim Taper' cut are my favorites. 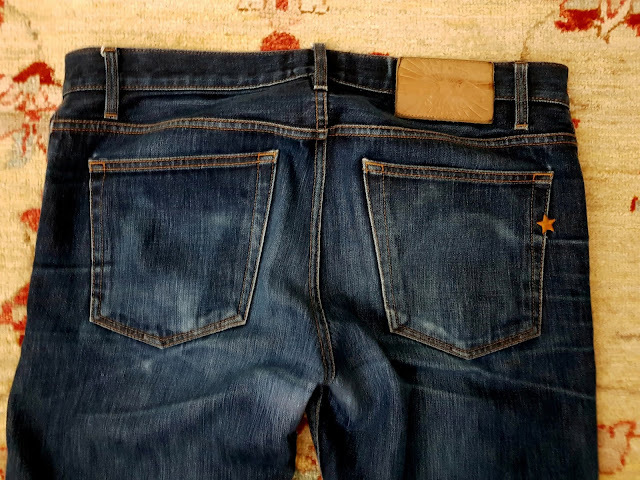 You'll find an earlier review from a little more than a year ago and in that review, this pair was a bit over 2 years old and had a nice fad going. I thought it would be useful to do an update on how the fad has progressed. 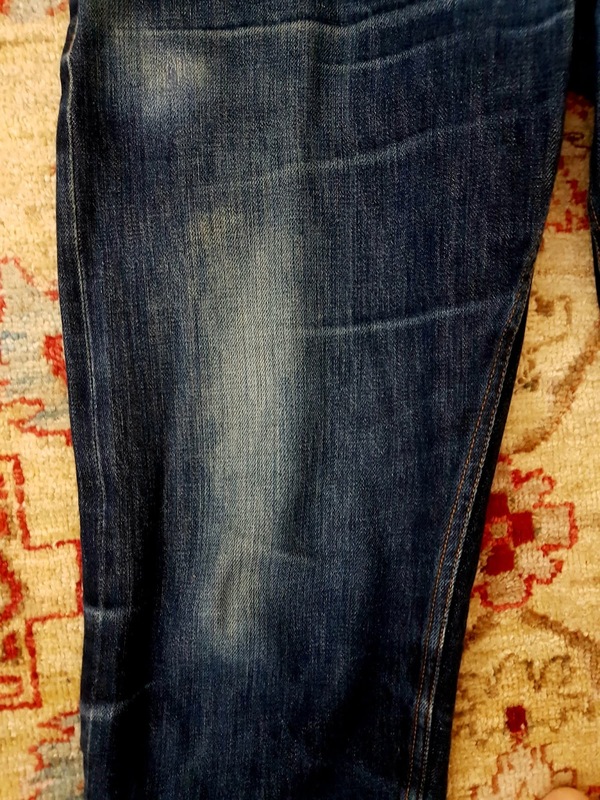 I think that perhaps these have been washed a couple more times. 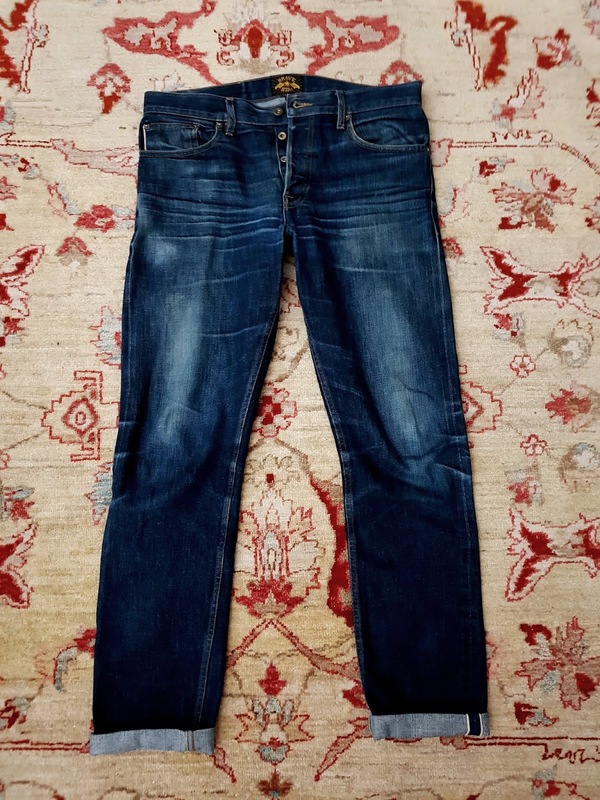 I wash them inside out using a short wash in the machine and hang them dry. 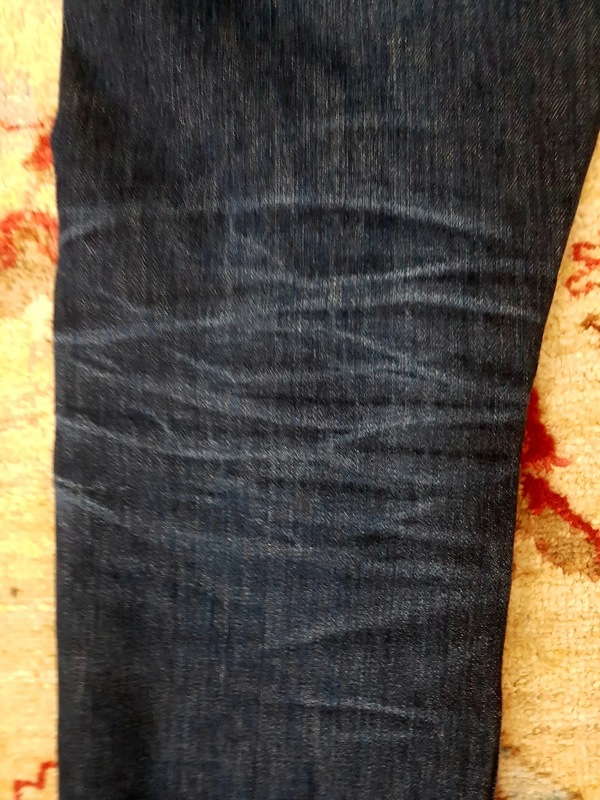 Additionally, I have had some repairs done to the back crotch area a common failure point for my denim for some reason and a minor repair has been done to the front right of the denim due to thining wear through wear my pocket knife sits in my pocket. 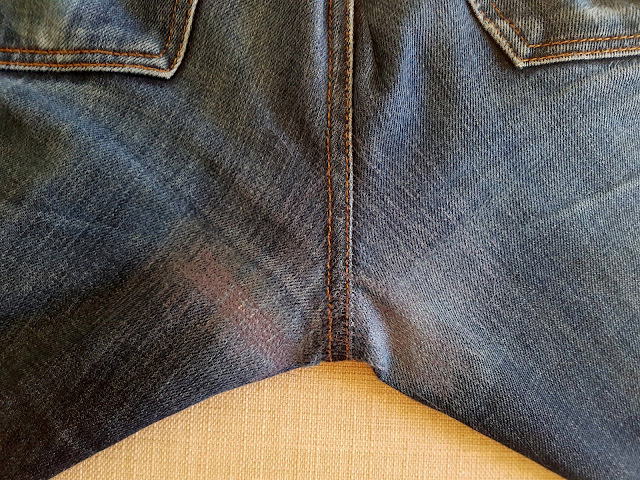 One thing to note about denim jeans is that they can over time develop holes in certain wear spots. I prefer to have these professionally repaired as soon as possible (ideally before a hole fully wears through) with reinforcement and darn-stitched in a way which renders the repair nearly invisible. 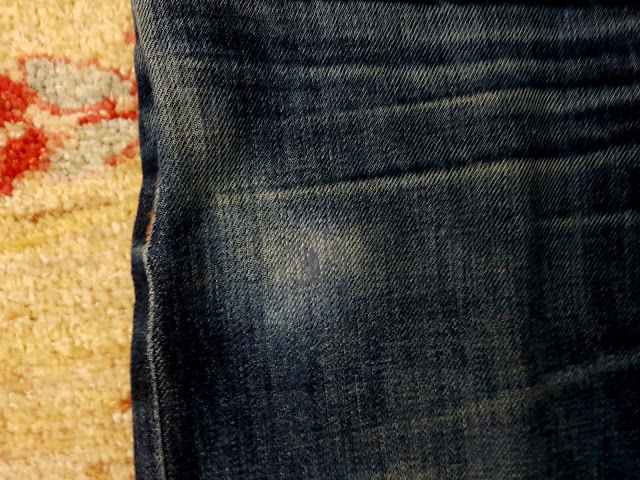 Many alteration tailors or denim specialist can do this work for you and thereby substantially extend the service life of your beloved denim.